Practically speaking, spring break may just be the catch-all name for the break which universities give their students around Easter. In reality, most of us are aware of the American tradition which ensures that those students head to a sunny beach for their break in order to imbibe large amounts of alcohol and have a good time. That’s the theme of Spring Break, this colourful online slot from Microgaming. Spring Break plays out over five reels and nine paylines and this is one of the older Microgaming slots which means the whole screen area is taken up by fifteen big symbols. Those symbols are an amusing range of spring break-related items and include an ice lolly, some beers, lots of different types of junk food, a few scantily-clad sun worshippers and a surfer. There’s a Spring Break wild symbol which will double your win if it contributes to a winning combo and there’s also a scatter Beach Party symbol which activates the main feature. There’s really only one extra feature in Spring Break here the name of the game is free spins. These are triggered by landing three or more of the Beach Party scatter symbols anywhere on the reels. You will receive a scatter win prize and you’ll also get fifteen free spins; during these spins each win will be tripled and the extra good news is that it’s also possible to re-trigger them by landing three more scatters. If you would like an extra gamble you can click the appropriate button underneath the reels after any win. You will now get the chance to double or quadruple your win by correctly guessing the correct colour or suit of the next card drawn. Don’t gamble your winnings after every success – if you want to have an extra wager, do it only occasionally and don’t try for too many correct guesses in a row. 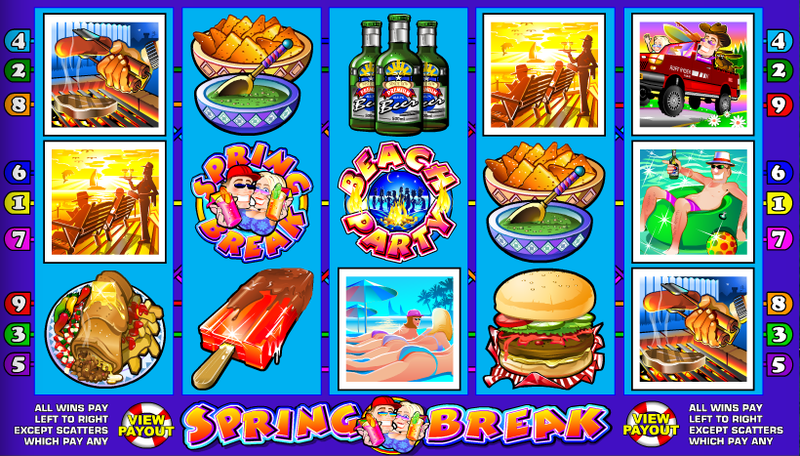 Although this is a fairly old slot now, it’s the only we’ve ever played with the spring break holiday as it’s theme. That surely makes it worth a quick go but don’t hang around too long.